Bachmann rolling stock is very attractively priced, constructed well and is usually well painted. However their trucks often require a bit of a "tune-up" before they will run well. The work is simple and requires little in the way of tools or materials. Regauge the wheel sets by gently twisting and pulling on the wheels so that a gap of about 1/32" appears in the plastic axle. Newer cars with metal wheels need regauging too. In this case, the gap will between the axle and one of the wheels. You should secure the wheel in its new position with a fillet of silicon sealer or Crafter's GOOP. If you have a Kadee wheel gauge, use it to set the gauge more precisely. 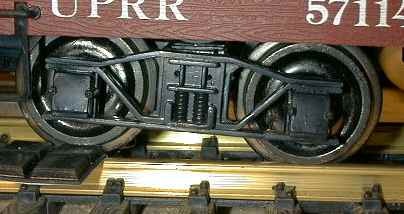 Unless they are regauged, Bachmann wheel sets will sometimes catch the open point rail of turnout when running facing point. Spin each axle to be see that the wheels turn freely and that the wheels are true. If a wheel set wobbles, discard it and get another one. Sometimes the factory does not lubricate the axle bearings. If there is no grease visible, add a very small amount of light oil (LGB 50019 works real well) to each journal. If you run outdoors, you might want to use graphite instead of oil as graphite tends to collect less dirt however the wheels won't run as freely as with oil. The coupler centering spring can sometimes rub on the center of an axle. If this is the case, trim a little off the end of the spring. MOST IMPORTANT STEP! Bachmann trucks are often not properly aligned such that only three wheels actually rest on the track. This misalignment guarantees derailments. I am guessing that the packaging method causes the trucks to take a set during shipment. Place the DETACHED truck on a flat and level piece of track and gently wobble the truck to be sure that all four wheels are resting evenly on the track and that the truck frames don't rock at all. If the truck needs adjustment, heat the crossbeam for about 10 seconds with a 1200 watt hair dryer and twist the truck firmly and hold it for a few seconds to set it back into alignment. You may have to make several passes to get it right. Trucks that are severely out of alignment may require shimming of the side frames. LGB fanatics should not be snickering at this point because LGB trucks sometimes have the same problem and their stiffer construction makes the trucks less capable of flexing back into alignment under the weight of a car. Fully sprung trucks, such as those from Aristo, are sufficiently flexible so that truck misalignment is not a problem. While you at it, you should replace the Bachmann coupler with a legitimate coupler as the Bachmann couplers just do not work very well. Check out Coupler Tips for more information on alternate couplers. You can optionally replace the plastic wheel sets with metal ones. Metal wheels add weight and lower the center of gravity. They roll better and don't leave that black gunk behind that fouls your track. Any body's metal wheels work better than plastic wheels in most applications. See The Large Scale Wheel Tips Page for more information on alternate wheels. Shim the wheel sets with #6 by 1/32" nylon washers to reduce the lateral play. The trucks will run more freely and the couplers will align better. You can get suitable washers, p/n 90295A080, from McMaster-Carr Supply Co. for $2.10 for a bag of 100. Reinstall the trucks. Check to be sure that the trucks rotate and rock freely on their pivots. On some trucks, the pivot hole will need to be cleared of a ridge of excess plastic. 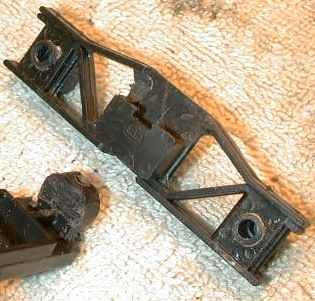 After this 10 minute tune-up, your Bachmann cars should run smoothly and be derailment free. Jim Jackson posted instructions for "equalizing" Bachmann 2-4-2 tender trucks on the LSOL Product Review Workshop. It really does work and the instructions are also valid for regular Bachmann freight car trucks. The modifications allow the truck to flex somewhat as if it was truly equalized so that the trucks can follow really bad track without derailing. Actually, if you just follow the instructions above to get all four wheels on the track, it'll probably be good enough. However if you really want the trucks to be tolerant of any track, the read on. Jim used a file for most of his work. I was insufficiently patient so I used a motor tool with a 1/8" cutter tool. This tool can really strip off plastic in a hurry, so if you use a motor tool, run it SLOW, no more than notch #2, or your will melt the plastic as you mill. Jim's instructions follow. The pictures are mine. To equalize the truck, the idea is to get the truck bolster to pivot between the side frames in the range of 10-12 degrees both fore and aft. Most of the better sprung trucks on the market have this highly desirable feature, which allows the truck to "flex" its way through rough track variances. With about 15 minutes of filing and fitting, the Bachmann Rigid Frame trucks can also be made to flex. The Bachmann truck bolster has a side plate that slips into a socket cast into the back of the truck sideframe. All that's needed is to remove enough plastic from mating parts to acquire the pivot. This is what I did, all on a trial and error basis. Nothing really critical about it, except one point as noted below. Here's what to do. Put the bolster in a vise and with a cross cut file (less apt to clog) file each side plate into an oval. ( ) Here's the critical point. Do not reduce the WIDTH of the side plates for about 1/16" across the center of the oval. This little "flat" keeps the bolster from shifting back and forth in the socket. Also leave a "flat" at the bottom of the bolster where the screw hole is. On the side frame, file down the socket about half way, until the slot for the bolster end angle brace is almost gone. Test the bolster in the socket as you go to make sure you have enough off of both pieces to get the pivot. When you're satisfied with the fit between the bolster and sideframe, convert the screw clearance hole in the bottom of the sideframe to a slot so the that the side frame can still pivot when the retaining screw is in place, I used a #42 drill as a mill to cut the slot and opened it slightly with a file where needed to clear the screw as it pivots. Upon reassembly, I put a #3 washer on the screw to keep it from passing through the slot as things wear. Of course, keep the screw loose enough to allow the bolster pivot action, yet snug enough to keep out excessive play. To test your handiwork, tape a 3/16" high x 1/2" long piece of wood along the railhead that will clear the flange, and roll the truck over it with just enough hand pressure to keep it going. If the wheel comes up onto the obstacle without causing any of the remaining three wheels to lose contact with the rail, then you "Done Good"! This is the job that I did one truck. Note that the pocket on the sideframe needs to be milled down to the sideframe. Also, the oval part on the bolster may be too thick on some trucks which will cause binding instead of a nice pivot. I had to file down the thickness of the side plate some to make it slip easily into the pocket and pivot freely. I tried the step test with a small piece of plastic under one wheel. The wheel did indeed step over the obstacle while the other three wheels stayed on the track. This page has been accessed times since 30 Oct 1999.